*** Stay Tuned to The Gold Within You virtual summit! Be sure to watch the many great guests, hosted by Cambria Berger. 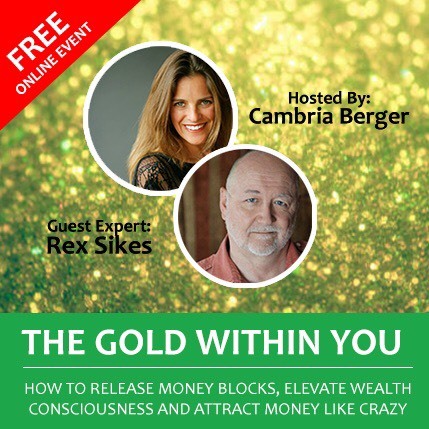 CLICK HERE FOR The Gold Within You – How to Release Money Blocks, Elevate Your Wealth Consciousness and Attract Money Like Crazy! My session already aired. There will be a 3 day replay after the summit closes on August 20. So, you can again go and watch my discussion with Cambria! I share lots of life changing tips! This summit is great! Check into it if you haven’t already. Watch and listen, learn and grow abundantly! Over 20 great guests. Do it now! GET ACCESS TO SUMMIT, for FREE, using this link. You can watch from anywhere! PLUS – Get my gift to you! You can still get my free gift to you by clicking right here! It’s a free 22 minute life changing MP3 titled ‘What’s Stopping You?’ Get it! Subscribe. Hit the Like Button. Want to help others? Share and spread the word. Previous Post‘How Come I’m So Stupid?’ Ever Thought That?Next PostStop Stopping Yourself! Keep Going!